Japan’s MOFA’s policy in their claim toward the Dokdo -Takeshima dispute involves their deliberate omission of their actions in Korea prior to, and during Dokdo’s annexation. In depth books in English detailing what was happening in Korea in this dark era are few and in between. By citing some reliable sources it can be made clear, Japan’s illegal incorporation of Dokdo was not a singular, isolated incident but rather a link in a chain of events leading to the annexation of the entire Korean peninsula. The purpose of this page is to make it clear that Japanese agression in northeast Asia was well under way before the Japanese “incorporated” Dokdo. A paragraph explaining the origins of Japan’s foreign policy can be found. Further below, is a historical outline of Japanese involvement in Korea before and during Japan’s Shimane Prefecture Inclusion of Dokdo. 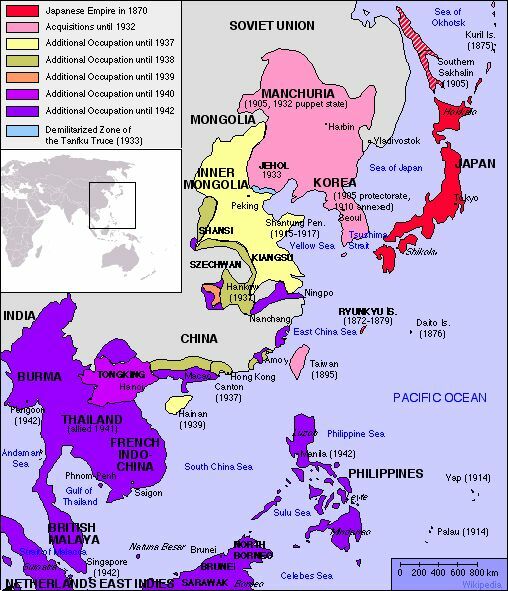 The map outlines other lands Japan had annexed as her colonial empire expanded in all directions. To the right, in a Tokyo Puck illustration, a Korean couple bow in respect as the Japanese sun godess Amaterasu shines . 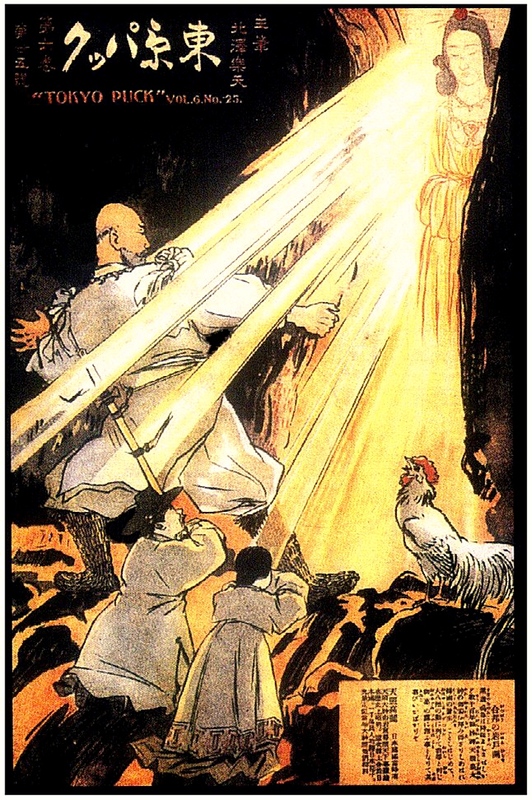 The Japanese man opening the rock cave is the first governor general of Korea, General Terauchi. To understand what Japan did in Korea/Dokdo and why they did it, we must first briefly study what happened in Japan prior to their invasion of Korea. In the 1850’s American and European warships began to arrive off Japan’s coastline. As young men, the would be Meiji leaders watched helplessly as the gunboats of Commodore Perry sailed brazenly under the coastal defenses at Edo. The Western method of opening Japan to commerce was to threaten war against the Tokugawa Shogunate (1603-1868) should it refuse to sign trade treaties. Such treaties-usually called “treaties of free trade and friendship” were signed with China in 1842, 1858 and 1860. They were also signed with Japan in the 1850’s and with Korea in the 1880s. As shown, (see link) documented plans for a Japanese invasion of Korea via Ganghwando date back to at least the year 1869. On the morning of September 20, 1875 the Un-yo, a Japanese naval vessel surveying the Western coast of Korea, landed ashore a party on Gangwha Island to “request water and provisions”. When Korean shore batteries fired on the Un-yo, the Japanese response was quick and severe. The well armed Japanese army quickly annihilated the Koreans who were poorly equipped with muskets (35 were killed). While the Japanese asserted the Korean attack was unexpected, certain facts about the incident show us the Un-yo’s landing was a deliberate attempt to provoke the Koreans into a military confrontation. This would in turn, give the Japanese “justification” for attacking Korea. To the right is an image of the Japanese Warship Un-Yo. These following facts make it clear the attack was a calculated provocation. 1.The landing coincided with recently failed Japan-Korea negotiations in Pusan. 2.It’s not plausible the Un-yo had run out of provisions so close to home and very coincidental it happened in Korea’s most strategic location. 3. It was well-known by other nations, the Koreans had fired upon French and American vessels that also had illegally entered this region. The Ganghwa Treaty called for a few provisions such as Japanese free trade in Pusan, permission for Japanese to travel freely between Seoul and Pusan, the right for Japanese ships to survey Korea, the right of Japanese to regulate trade in open ports. In short, this agreement resembled the unfair treaties the Westerners had imposed on Japan decades before. Evidence suggests that the Meiji government was prepared to use military force against Korea if the Kuroda-Inoue missions were rebuffed, insulted or attacked. Before his departure Kuroda set forth a plan of action for the dispatch of troops to Korea in the event that “negotiations” broke down. During the meeting Kuroda made it very clear that Korea might face an invasion if it did not sign a treaty with Japan. When a supply ship arrived a few days later with a force of eight hundred men, Kuroda Kiyotaka told the Koreans there were four thousand. In the summer of 1876 the Ganghwa Treaty was “renegotiated”. The supplemented treaty was even more unequal than the commercial treaties the Japanese had signed with the Western powers decades earlier. First, the Japanese were allowed to purchase goods with their own currency at face value, second the Koreans agreed to a complete exemption of tariffs on Japanese imports and exports and third the Japanese agreed not to levy duties on goods coming from or going to Korea. Throughout the 1880s and 1890s important events transpired that would shape Japan’s foreign policy toward Korea. In 1882 the Chulmupo Treaty would be signed by Korea and this would prove significant a years later . During the spring of 1894 there was an uprising by a rebel group known as the Tonghaks. As Chinese forces advanced toward Korea, the Japanese army general staff mobilized the Fifth Division and requisitioned several transports. On June 10th Otori Keisuke a Japanese Minister who had landed at Incheon the day before marched into Seoul with a force of several hundred marines. The Korean government protested vigorously, but the Japanese legation brushed their protests aside, insisting on their right to protect their own citizens in time of trouble. 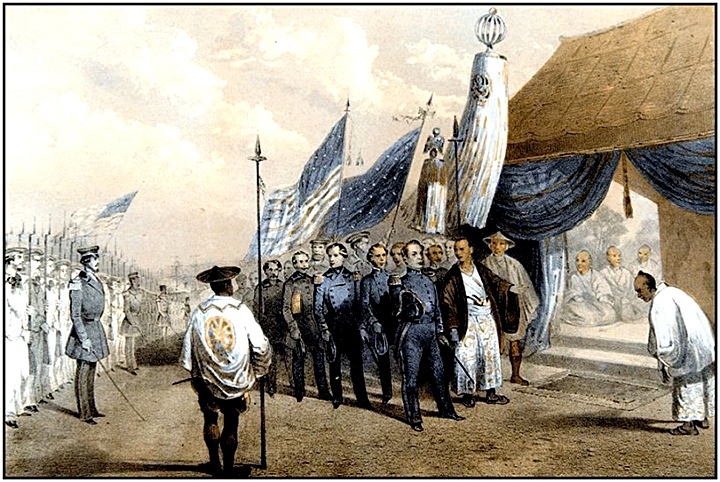 As mentioned the unfair Treaty of Chemulpo had been signed in 1882, Article 5 of the treaty allowed the Japanese to protect their legation and the Japanese community. By the end of June the Japanese government had put 8000 men into Korea. All throughout the Japanese presence in Korea, King Gojong attempted to offset Japanese control in the country by granting concessions such as railway, mining and logging to other nations such as Russia, America and England. War between China and Japan was officially declared on August 1st 1894 and the Imperial Japanese defeated the poorly armed Beiyang Army in the Battle of Pyeongyang on September 16th and quickly pushed North into Manchuria. 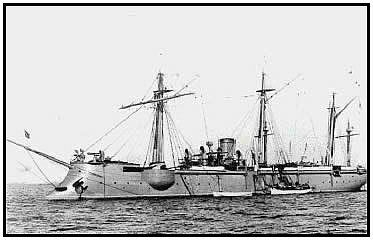 The Imperial Japanese Navy destroyed 8 of the 12 warships of the Chinese Beiyang Fleet off the mouth of the Yalu River on September 17th 1894. The Chinese fleet subsequently retreated behind the Weihwai fortifications. However, they were then surprised by Japanese ground forces, who outflanked the harbor’s defenses. By November 21 1894, the Japanese had taken the city of Lushunkou (Port Arthur). The Japanese army allegedly massacred thousands of the city’s civilian Chinese inhabitants, in an event that came to be called the Port Arthur Massacre. After Weihaiwei’s fall on Februaty 2 1895 and an easing of harsh winter conditions, Japanese troops pressed further into southern Manchuria and northern China. By March 1895 the Japanese had fortified posts that commanded the sea approaches to Beijing. Faced with defeat, China signed the Treaty of Shimomoseki on April 17 1895. This treaty agreed to the total independence of Korea and ceded the Liadong Peninsula in southern Fengtian Province, Manchuria Taiwan and the Pescadores Islands to Japan in perpetuity. The map on the right details the lands acquired by Japan with the appropriate time in brackets. Japan had annexed Taiwan, Hokkaido, the Kuriles, the Pescadores, the Liatung Peninsula, Marcus Island, Bonin Islands and the Miyako – Yaeyama area all before 1900. It was the aftermath of the Sino-Japanese War that shaped Japan’s method of handling the annexation of Dokdo and Korea. After the war, Russia, France and Germany banded together in the Triple Intervention to prevent Japanese territorial encroachment in Manchuria, and then proceeded to carve up the territory for themselves. Russia moved almost immediately to occupy the entire Liandong Peninsula and especially to fortify Port Arthur. France and Germany also took advantage and gained port and trade concessions. Qingdao in Shandong Province was acquired by Germany and Weihaiwei by Great Britain.The Triple Intervention embittered Japan, sowing the seeds for the Russo-Japanese War of 1904-1905. The lesson of the Triple Intervention also made Japan very careful not to use tactics in Korea that might appear overly aggressive as it might cause other powers to intervene in Korea as well. It has been asked on other forums why didn’t the Koreans protest more vigorously upon hearing Dokdo was incorporated in 1906? What was the situation prior to the 1905 Protectorate Treaty? As explained below Korea’s sovereignty and ability to protest had been long since compromised before 1905. On the night of February 8 1904, the Japanese fleet under Admiral Heihachiro Togo opened the Russo-Japanese War with a surprise topedo attack on the Russian ships at Port Arthur and badly damaged two battleships. On the same day cheering Japanese residents watched a Japanese Naval squadron-one armored cruiser, five light cruisers, and eight torpedo boats-bombard two Russian warships off Palmido Island at the mouth of Incheon Harbor in Korea. Despite all the attention it has received from historians, the attack on Port Arthur was just a covering operation for the real target of Japan’s opening move of the war, the invasion of Korea at Chemulpo (Incheon). This critical operation was given to Rear Admiral Uriu Sotokichi. 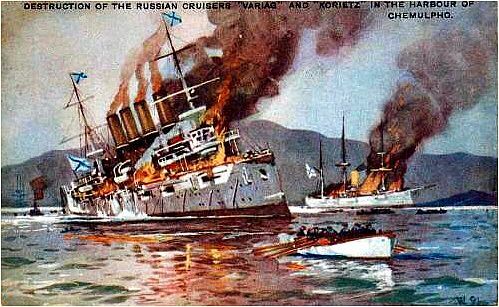 About seven miles up the channel from Yodolmi the Russian cruiser Varyag and gunboat Korietz were anchored. 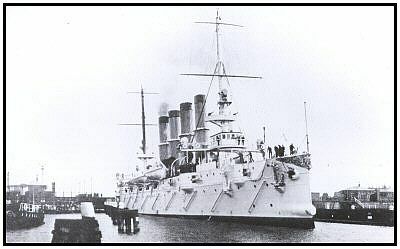 Varyag accepted a badly uneven battle with the Japanese squadron of Admiral Uriu (one armoured cruiser, five protected cruisers and eight destroyers) during her heroic breakthrough from Incheon. Having lost 82 men dead, 190 injured (out of 570) and outgunned, the crew decided not to surrender, but to sink the ship. The crew was saved, however. Unable to break past the Japanese squadron by mid-afternoon, the Korietz and the badly battered Varyag returned back to Chemulpo harbor, where both took refuge near the neutral warships. 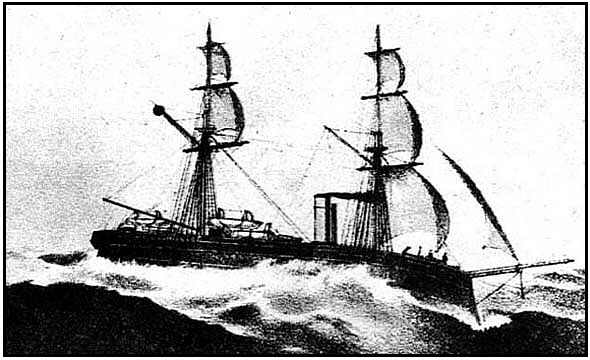 At 16:00, the Korietz was scuttled by its crew. The two images on the left above this text are the Russian ship Varyag. The top picture was taken in the year 1900. 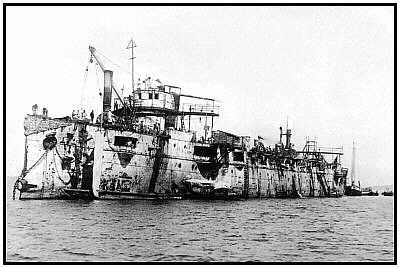 The bottom photo was taken after the Battle of Chemulpo (Incheon) on February 9th 1904 and shows the heavy damage she sustained. The Varyag was later raised by the Japanese and repaired. She served with the Imperial Japanese Navy as the light cruiser Soya. The top right image is of the obsolete Korietz. Despite having heavy guns she was also no match for the Japanese. The Korietz was scuttled by her crew as well. On the bottom right above is a propaganda postcard depicting the Russian scuttling of both ships to avoid capture. Within several hours the Incheon Port was under Japanese control with sentries posted at key points and squads of soldiers patrolling the streets. To the surprise and distress of the Korean court, several Japanese units began marching toward Seoul. Afterward it took Hayashi Gonsuke two weeks to manipulate cajole and intimidate the Korean leadership into signing a protocol permitting the Japanese to undertake military operations on Korean territory. 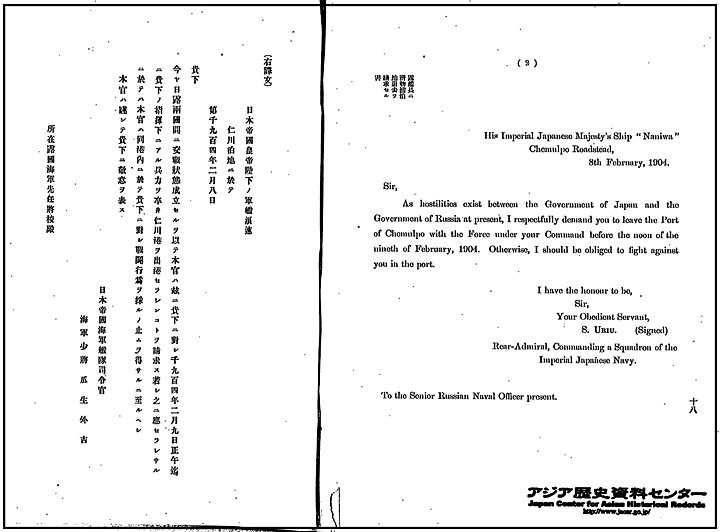 The protocol signed on February 23 1904, allowed the Japanese to occupy stragetegic areas of Korea to achieve the territorial integrity of Korea if endangered by the aggression of a third Power or internal disturbances. To forestall any backtracking Hayashi arranged to remove all chief anti-Japanese leaders from Korea. Thus, as of February 23, 1904 about a year before the Japanese annexed Dokdo, the Japanese were “legally” allowed to place their troops anywhere in Korea. As explained, even before the formal establishment of a protectorate in Korea, the Japanese were making de facto inroads on Korean sovereignty. 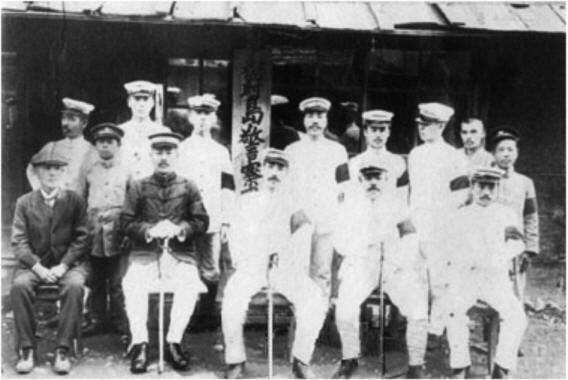 Above left: During the Russo~Japanese War of 1904~1905 Japanese police were located in strategic areas of Korea. The above picture is of Japanese police stationed on Ulleungdo Island at this time. 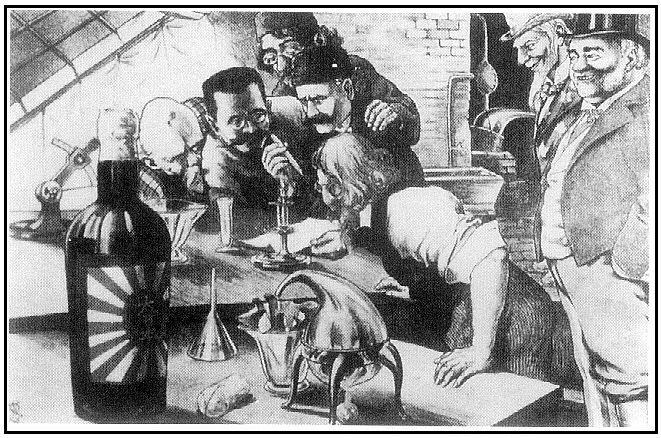 Above right: Another Tokyo Puck illustration: This drawing “Japan’s Enigmatic Passage into The European Class”, Uncle Sam and John Bull look on approvingly as western powers scrutinize the vial. 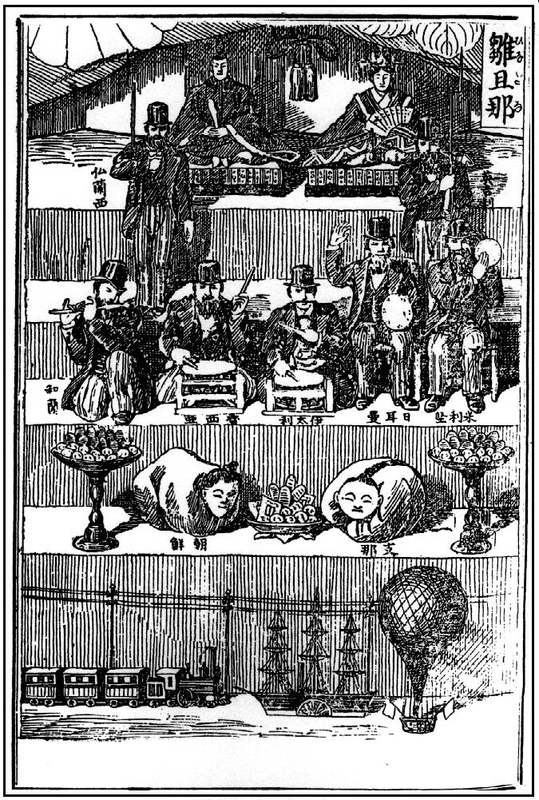 Printed after the Japanese had all but won the Russo-Japanese War, this drawing symbolized the western acceptance of Japan as a fellow colonial power. By studying the important historical events of the late 19th Century and early 1900s it is possible to understand why Japan employed such tactics when they annexed Dokdo and later Korea itself. Japan obviously used her own version of gunboat diplomacy to bully Korea to opening her port just as the Western powers had done to the Tokugawa Shogunate. It’s historical fact, that as of early 1904, well before Dokdo was incorporated, the Japanese had established a strong foothold in Korea in a multitude of Korean affairs. The Japanese had assumed positions in Korean central government with sweeping powers over all the cabinet’s financial decisions. Already Japanese had acquired numerous land holdings some legal and some not. They had already gained control of the Korean railroad system, telegraph, telephone, and mail systems. Most importantly, in early August of 1904 the Japanese appointed foreign diplomatic advisor Durham White Stevens thus, disabling the Korean foreign ministry . In practice, then, if not by law the Japanese were moving toward a protectorate at all levels before the end of the Russo-Japanese War. Not surprisingly, Japanese Takeshima websites do not provide even basic historical or political context when describing Japan’s involvement in Korea around 1870~1905. Despite their expansionist acitivites in Korea before, and during the Shimane Prefecture Inclusion of Dokdo, some Japanese boldly insist this was a legitimate land acquisition. This denial campaign seems in line with Japan’s foreign policy on other issues of contention from her past that need to be addressed.